One of Luck Stone’s 25 sites, captured by the senseFly eBee RTK drone. 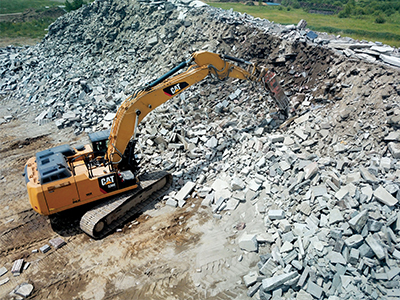 Photo courtesy of Barrett Dixon Bell Ltd.
As one of the largest family-owned and operated aggregate producers in the United States, Luck Stone has more than 25 different sites stretching from South Carolina to Maryland. 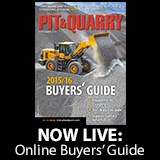 With such a vast area to cover, including quarries, rail yards and distribution yards, inventory management was historically time-consuming and costly. But by adopting unmanned aerial vehicles (UAVs), Luck Stone is able to successfully monitor stockpiles across its many sites while obtaining more detailed and integrated insights to benefit the business. Aerial operations have enabled the team to improve surveyor safety by minimizing the time spent around heavy machinery on active mining sites. Photo courtesy of Barrett Dixon Bell Ltd. 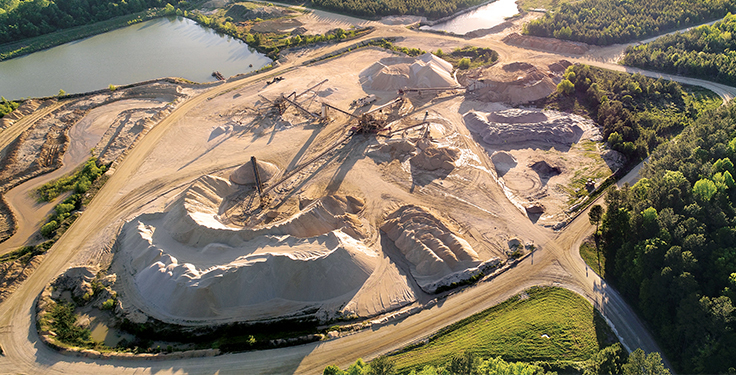 Performing regular, physical inventories of material stockpiles is crucial for Luck Stone, as the company relies on accurate results to shape both its accounting and future project planning. 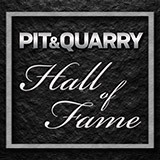 Still, as the business has grown since its launch in 1923, the company’s geographical reach has spread considerably, now including quarries across several states. 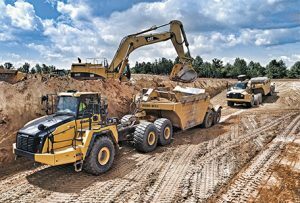 With an estimated 9,000 acres to cover on a quarterly basis, stockpile investigations can involve a lengthy process – with long lead times for data processing. In addition to the vast amount of land that needs to be covered, the elements and activity at certain sites can be challenging when mapping. For instance, many of Luck Stone’s sites are active mining areas, with heavy machinery being commonplace, increasing the safety risk significantly for surveyors carrying out ground investigations. Until recently, Luck Stone performed two inventories a year using a small manned aircraft, typically taking about a month each to complete. Although this technique proved safer than a traditional terrestrial approach, using a small airplane was a time-consuming and costly process. It was also challenging to find a suitable window to fly in, as perfect weather across all sites was required for accuracy. So, Luck Stone looked at innovative ways to map its terrain while ensuring reliability and maintaining surveyor safety. Luck Stone’s Eric Warinner prepares to launch the eBee RTK. Photo courtesy of Barrett Dixon Bell Ltd.
As an early adopter of UAV technology, Luck Stone partnered with Airware, a data collection processing company, to explore potential drone solutions on the market that could optimize efficiencies across its mining sites. 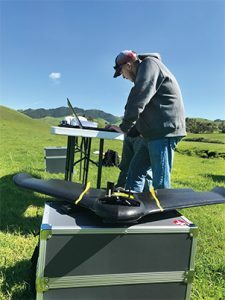 An aerial technique was determined to be the best approach to calculate accurate and reliable stockpile data while also improving surveyor safety. Following recommendations from Airware, Luck Stone purchased a fully autonomous senseFly eBee RTK mapping drone. 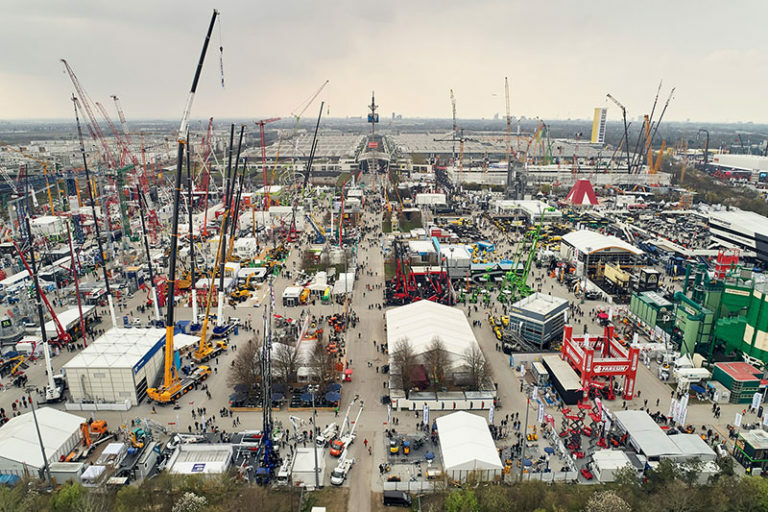 Additional features, such as its real-time kinematic (RTK) capability and virtual referencing stations option, could also provide further data collection benefits to the team. To map the stockpiles at each of Luck Stone’s sites, the team first carried out a pre-flight assessment using the eBee RTK’s built-in eMotion 3 flight planning software. The team checked the feasibility and safety of the task and planned the route accordingly. Flying under the legal limit of 400 ft. across sites up to 1,000 acres, the eBee RTK drone is deployed between one and four times, depending on the size of the site and weather conditions. Each flight takes, on average, 30 to 40 minutes. Following a flight, raw data is submitted to Airware’s processing softwarethrough an online platform. Between 24 and 48 hours later, the team has access to detailed contour patterns and imagery, which is shared with each site for identification of stockpiles. The data can then be sent to the central financial department at Luck Stone, which confirms the stockpile amounts and forms an accurate inventory of all materials. The benefits of using a UAV solution to map stockpiles allows Luck Stone to carry out more inventories than its previous method of using a manned aircraft. The speed and flexibility of the flight process, coupled with the fast turnaround of data, enables the team to perform quarterly inventories – a significant improvement from previous years when they were limited to twice a year due to cost and time constraints. Each individual site can now be assessed in a maximum of two and a half weeks, with the team having achieved this within one week to meet a particularly short deadline. The fast processing of data has also improved operational efficiencies, as it allows the team to continue to fly the drone between different projects, relying on a continuous stream of data from Airware instead of the previous two-week lead time to receive data. Despite the reduced administrative burden following each flight, the number of employees required to carry out the process remains the same. One person is still needed on site, with another two supporting with data collection in the office. “The depth of detail that we have been able to achieve using UAVs has really set our results apart from previous years,” says John Blackmore, survey and mapping supervisor at Luck Stone. “We have received a better resolution of data and benefited from greater flexibility and overall accuracy with a drone. For instance, using a manned aircraft could previously achieve a ground spatial distance of 1 ft. resolution, whereas now it is fewer than 6 in. Also, Luck Stone can now have at least four datapoints per year, compared to the previous two using a manned aircraft. This helps the company streamline its processes in the long-term. In addition, Luck Stone achieved significant cost savings as a result of adopting UAV technology in this sector. For example, using a manned aircraft across all 25 sites would cost around $50,000 to perform each inventory, with this taking place twice a year. With the integrated drone solution, stockpiles can now be measured four times a year at about the same cost thanks to the flexibility and rapid deployment of the drone. Using the eBee RTK drone as part of an integrated, end-to-end approach, Luck Stone is able to collect highly accurate, professional aerial data for its sites quickly and easily, helping to save valuable time and resources over the course of the year. The quarterly results obtained from using UAVs are instrumental, not only in sales planning, but also in predicting future demands in the marketplace. Luck Stone’s leadership team was curious about, and receptive to, the idea of investing in UAV technology to improve efficiency. The company also has a mission that’s centered on the potential in people, so, empowering a team to explore the possibilities UAV technology holds was directly aligned with the company’s beliefs. The investment has also led to further requests for the use of drones in other departments at Luck Stone, such as during the inspection process or in thermal imaging. In the future, the company plans to invest in further eBee mapping drones for more frequent use and is exploring the potential of regional versions with automated landing, helping to reduce the need for on-site operators and improving operational efficiencies across the company. Eric Warinner is chief UAV pilot at Luck Companies.